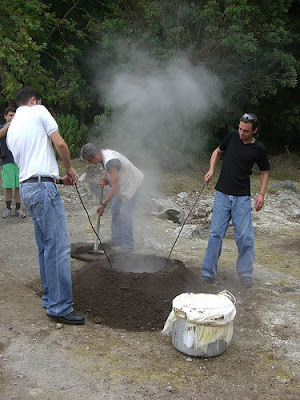 Today I will talk about how you can spend one day in a small village inside the crater of a volcano with geotermic activity. Furnas is a stratovolcano with two calderas which date back to approximately 30,000 years ago. The second approximately dates back to 20,000 years ago. The western of the two calderas is partially filled by a crater lake, Lagoa das Furnas, at an elevation of 359 m (1,181 ft). Fumaroles and mud sands are located at the northern part of the lake. Furnas is a parish in the district of Povoação in the Azores. The population in 2001 was 1,541, its density is 45.5/km² and the area is 33.88 km². The parish is one of the largest in the island and in the Azores. It is located east of Lagoa and Ponta Delgada, west of Povoação and southeast of Ribeira Grande. The mountains are to the north with several valleys including one to the north-northwest. Most of the mountains are forested while grasslands are found at higher elevations. Furnas will take you all day if you want, because there is a lot to do. You can star by going to the Caldeiras next to the Lake, where the tradition is to cook "cozido" in a hole in the ground. You can watch how it is done, even today people do it (despite the fact that they can also do it at home in the hoven) because the taste is different. After that you can walk (carefully) around the bubling hot natural jacuzzis and enjoy the natural beauty of the surronding environment. 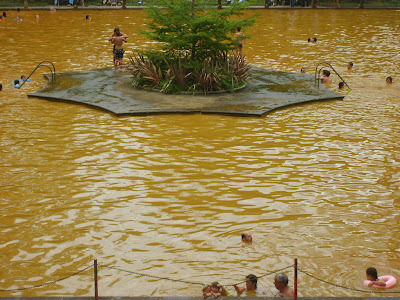 After that, you can go to the village and see the garden of Terra Nostra (astonishing botanic park) and take a long bath in the pool with the yellow warm water (heaten up by the geotermic activity) - when you overcome the fact that the water looks like mud you will want to stay inside the pool for hours! After that, yoo will be really satisfied with the day you spent in Furnas.